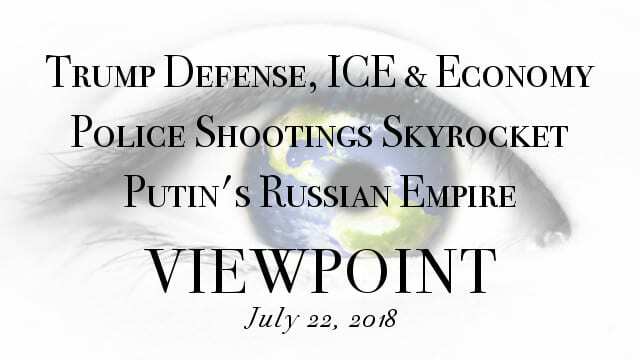 White House on Defense, Abolishing ICE, Economy Soars – The Helsinki and NATO Summits had the media pulling out all the stops to alarm the public that the sky was indeed falling and Trump was the problem. House Republicans held a vote stating support for ICE in the hopes of forcing Democrats to go on the record on the issue. Did the House Democrats take the bait? President Trump announces a skills training program targeted at creating 500,000 new jobs, as the economy continues to soar. Dr. Stephen Steinlight and Dennis Santiago provide the analysis on the top stories of the week. Police Shootings Skyrocket – Eight police officers were targeted in different states at different times in a 48 hour period; what is going on? Since these cases are not related, and considering the escalation in these attacks, does this conclude a bigger problem in our society? What steps can both police departments take, and what could Washington do to curb this escalating violence? We will take this on with two of the finest in the nation, Dr. Ron Martinelli and Sgt. Betsy Smith lay out a compelling case for what ails us! Putin’s Russian Empire – Is Trump playing Putin, or is Putin playing Trump? What is the psychology behind these two leaders and how the Helsinki Summit appeared to a global audience? What is the cost of isolation from Russia? Will sanctioning Russia even more be effective? Who is Putin? How did he come to power? Former CIA head Brennan calls for impeachment accusing Trump of high crimes and treason, is this warranted? Our panel discussion will take a deep dive into the semantics behind the summit with Ilana Freedman, Del Wilber and Ava Armstrong.